BioWare had more than few ideas that never made it into the final cut of Shepard's story. The Mass Effect saga spans a massive, interesting universe with countless opportunities for side-stories. We've witnessed many of them as we followed Commander Shepard and the crew of the Normandy, but what we saw was the result of a long chain of thought and polish - some events, scenes, and even core characters were dropped during the creative process. Now that Shepard's story is over, BioWare has shared some stories about the content that was never released: the Mass Effect that could have been. Some of the cut content was dropped because of technical challenges. 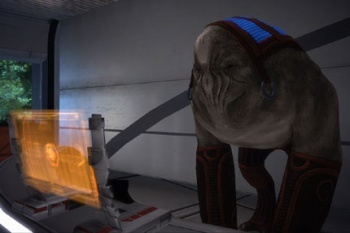 Mass Effect lore includes a number of exotic alien species beyond the roughly humanoid Council races; the quadruped Elcor, jellyfish-like Hanar, and insectoid Keepers (to name a few) provide some spice in the intergalactic community, but these more outlandish species were largely pushed to the sidelines in the plot of the games. BioWare had wanted to give them more attention, even seriously considering bringing a non-humanoid squadmate onto Shepard's crew, but the technical implementation would have been too difficult. The humanoid races in the forefront share the same basic skeleton, allowing for easy animation for common acts like readying a weapon. The cost of developing a whole new skeleton with the same level of detail, BioWare decided, was better spent by improving the rest of the game instead of pouring that effort into one character. BioWare also had ideas for scenes that would break up the typical flow of gameplay (watch out for minor Mass Effect 2 spoilers ahead). In the entire trilogy, the only time players control someone other than Shepard is when Joker has to sneak through the Normandy during the Collector ambush. The developers had at least a couple more scenes like this in mind: players would briefly control a Horizon colonist during the Collector attack, and there'd be a moment where you'd play as a Quarian scientist just before Tali's loyalty mission. In the end, these scenes were dropped in favor of keeping Shepard's story as the immersive, primary narrative. It does explain some things, though: there's a cutscene showing the Horizon attack in detail, despite Shepard not being there to see it. It might have made more sense to have the player walk into the situation as blind as Shepard was, but if there were already assets created for the Collector attack scene, why not throw them into a cutscene? The next entry to the Mass Effect series will provide a chance to see the universe from a different perspective, so some of these more experimental ideas may find a way into that game. Personally, I would buy it in a heartbeat if players got to recruit Blasto the Hanar Spectre. I hear that guy saved the Citadel.